Point 660, Greenland Ice Sheet, 20 miles east of Kangerlussuaq on the west coast. Physics is important. An enormous amount of heat is required to melt ice. This is why ice keeps things cool for so long. A thing called the Enthalpy of Fusion says: 289 times more heat is required to change the temperature of ice from 32 to water at 33 degrees F, than is required to change the temperature of water one degree. The ice sheet is now melting rapidly as all the darkness (dirt) on the ice sheet shows. This dirt was carried to the ice sheet on the wind as dust, some from as far away as Siberia. As the ice melts, the dirt is left behind because melt creates a very porous surface where dust does not runoff very well. Because the ice is now melting, this means that the limits of the “heat of fusion” have already been met. When serious discussions about global warming gases and fossil fuels began in the 1980s, all that was needed to prevent what would become labeled as dangerous climate change was a reduction of the emissions of global warming gases. Since that time, we have emitted as much CO2 as we emitted in the previous 250 years. Delay has changed the game, but policy has stayed the same. Because warming from carbon dioxide emissions is delayed 30 or more years because of global cooling from cool ocean water and polar ice, our atmosphere is just now coming into equilibrium with atmospheric CO2 concentrations from the 1980s. So considering the additional greenhouse gases emitted since the 1980s, there is enough CO2 in the atmosphere now to create at least as much warming as we have already experienced from the beginning of our emissions of fossil carbon. The reason that past strategies asserted that emissions reductions (efficiency strategies, fossil fuel energy generation reduction, etc.) alone could deal with climate pollution was the 2 degrees C limit to dangerous warming. Today, the limit is 1.5 C according to the Intergovernmental Panel on Climate Change (IPCC) Paris Agreement, or likely less as we will almost assuredly see in the IPCC report on 1.5 C upcoming in 2018, and as we have seen in study after study that shows the limit to dangerous climate change is less than 2 C. Of even greater importance though, these limits, 2 C, 1.5 C, even less than 1.5 C, they all do not deal with abrupt change. Record Greenland Melt August 2012. This image is from 35 miles inland from the edge of the ice sheet due east from Point 660. The ice is about 2,000 feet thick here. The dark brown color is eons of dust, melted out of the ice sheet. Most of the dust does not wash away with melt because the surface of the ice is exceedingly rough. 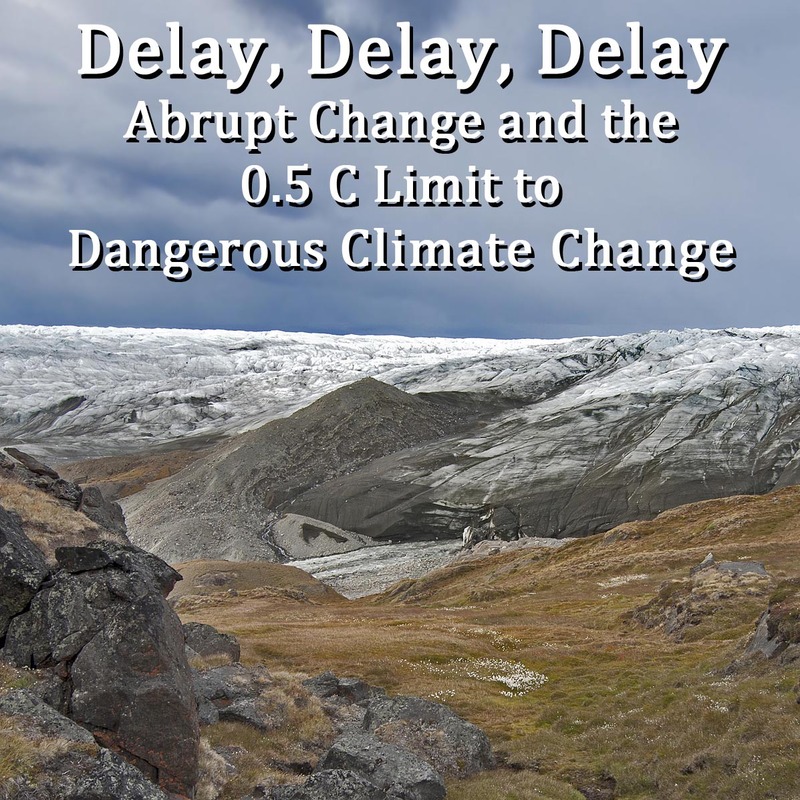 Abrupt change is in addition to impacts that have been projected. There a many different kinds of abrupt change: arctic sea ice disappearing 70 years ahead of schedule, the Gulf Stream shutting down more than a hundred years ahead of schedule, Antarctic ice loss a hundred years ahead of schedule. These abrupt changes all carry their own side effects: inundation of enough coastal resources to create unrecoverable economic collapse, undersea methane clathrate disintegration, vastly increased warming because of loss of albedo, and radically changed weather patterns in the northeastern U.S. and northern Europe. These are not hypothetical impacts, they have already begun, but we cannot yet model their future evolution. The IPCC depends on modeling to create their future projections. Even though we have seen these kinds of abrupt changes in prehistory, because they are not modellable into the future, they are not a part of the consensus of scientific research that policy relies upon. 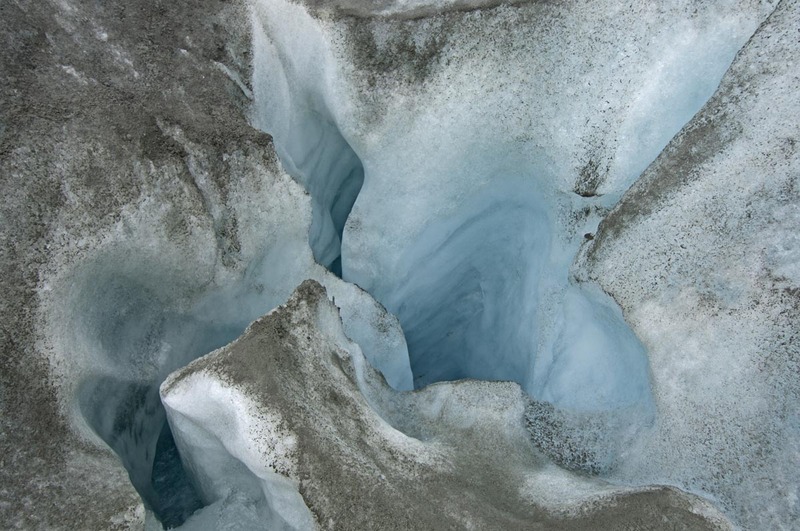 The rough nature of the ice is evident from dirt clinging to the edges of this moulin, a melt drain that leads to the bottom of the ice sheet. The great conundrum then is that we have all of these abrupt changes already happening that are not a part of the science that goes into policy. What this means is that the threshold to dangerous climate change is even lower than the lowest limit yet contemplated. James Hansen places this limit in the summer of 2017 with “Young People’s Burden: Requirement of Negative CO2 Emissions” at 350 ppm CO2, or about 1 C — about where we are today, maybe a little cooler. But these abrupt changes we are now experiencing began with warming much less than what we are experiencing today. The first warning that West Antarctica was collapsing was in 2006. The first warning of the Gulf Stream shutdown was in 2012. The first warning of arctic sea ice collapse was in 2008.